Will We Have Enough for Our Children's University Tuition? Will We Have Enough for Our Children’s University Tuition? A reader left a comment asking if our financial freedom income goal would be enough to cover post-secondary education costs for our children. The simple answer is yes, but not through excess passive income, but through some planning and investing when the kids were born. While I believe that there is merit in having children pay for their own education (my wife and I did this), we have decided to offer our kids a helping hand in their higher education pursuits by setting up a family RESP. For those new to RESPs, here is an introduction to registered education savings plans. Mrs. FT and I had our first child in 2008 and set up a self-directed RESP account shortly after (like the same week). At the time, one of the lowest cost and easiest ways to index a portfolio was by using the TD e-series mutual funds. If I were to start over today, I’d probably open an account with a discount brokerage that offers commission-free trading of ETFs, and go with a simple ETF portfolio of 1 or 2 ETFs. When we had our second child a few years after, we decided to stick with TD e-series as the path of least resistance. No fees to buy or sell, just a slightly higher MER than a proper index ETF portfolio. How Much will Tuition Cost in Canada? Before we get into investment growth, we need to know what we are working towards – the cost of tuition (plus other fees)! I wrote an article a little while back about the cost of Ivey League schools in the US. I concluded at the time that the going rate was $50k USD/year (including accommodations), or $200k USD for a 4-year undergraduate degree. The numbers are insane, but most Canadians that study in the U.S get scholarships of some sort which help offset the madness. Year over year, the average increase was 2.8%. Assuming the same increase compounded over the next 7 years when my first child is due to start post-secondary, the average tuition will be closer to $7,732/year. Of course, these are average numbers that vary greatly depending on the degree that you go after. Here are some of the average undergraduate tuition fees by field of study (2016/2017). I find the numbers quite interesting, and one can only assume that higher the cost of the field of study, the higher the demand. The one field that really stands out from the rest is dentistry which is head and shoulders above the others (even medicine). Another cost to consider is if the kids move away for school. If they do, then we’d need to add another $10k-$15k/year to the cost. 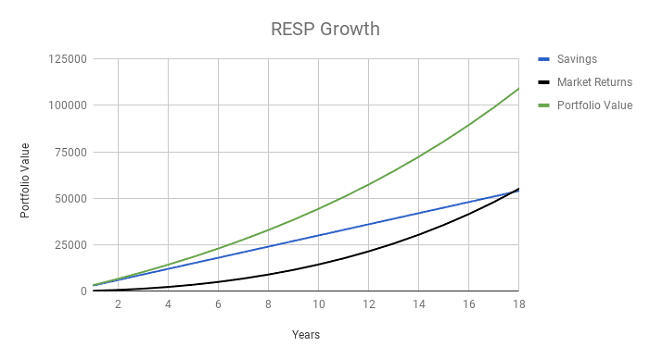 How Big will the RESPs Get? So what kind of returns can we expect from an indexed portfolio? Time for some charting fun! Judging from the chart (and the assumptions above), by the time my oldest child reaches post-secondary (age 17), the RESP will have almost $100k CAD in the account. Although the actual long-term return on that account is closer to 8.5%, I think this conservative estimate is fair since I’ll likely be converting at least first years tuition into a GIC in year 16 or sooner. Assuming that the indexed portfolio returns 7% annually over 17 years, we’ll have about $100k in each RESP account. While $100k sounds like a lot of cash, it can get eaten up pretty quickly depending on the school, program, and where they live. If my kids decide to do dentistry which is outside NL, it will cost over $30k/year for 4 years which would require supplementary funds. If they go to a school outside NL that has more of an average tuition rate, the RESP would more than cover tuition plus living expenses. If the kids decide to stay in NL (fingers crossed) where tuition is cheap, programs are decent, and accommodations are free – the RESP will have enough for not only their first degree but also a graduate degree (s) if that’s the path they want to take. Should I buy Whole Life Insurance for my Children? One minor nitpick: the Canada Education Savings Grant maxes out at $7,200, so the amount invested per year would drop after 14 years unless you made up the gap out of your own pocket. Doesn’t make too much of a difference to your model though. Thanks for picking that up Greg – you are right on the money! Is tuition free in Ontario? I thought it was only Quebec. I’ve been talking with a friend about RESP’s recently. He had modeled it based on the tuition for Engineering here locally, which was about 8500. There were some other faculties (like business or pharmacy) that are definitely potentials that were quite a bit more. I think he ended up changing it to 10K. Probably best to model it on 7 or 8% or whatever for the first 14 or 15 years, then start dropping the return as one would expect you’d be in very conservative allocations by 16 or so. I don’t know if we’ll tell our kids they have RESPs beforehand so they work harder for the scholarships. They’ll definitely have to work summers, and maybe throughout the school year if they want. Or maybe match them $ for $ on what they save during high school or over summers. Hi Nobleea, the free tuition is for Ontario residents below an income threshold. I believe that I read that even with a family income of $80k there are generous tuition rebates available. I’m also hoping that the kids supplement with scholarships, and I also expect that they’ll get some work experience. Just going through this with my 17 year old son in Ontario. Free tuition is for household income of under $50K which for most areas would be almost poverty level income. Plus that covers tuition only so the extra $10K per year has to come from somewhere (if the program they take is not available locally). For us, we are a two income family making reasonable incomes so we are above the $50K threshold. We do qualify for a $2000 grant through OSAP and most of the schools offer merit based scholarships of $2 – 3K per year assuming they keep their grades above 80%. My son has an 84% average so he is getting the $2K scholarship level. Total per year cost is about $18K assuming 1st residence and 8 month rental for the rest of the years (most landlords want 12 month lease). So out of pocket for year one is $14K. We have some RESPs but are going to cash flow the rest and out other financials on hold. Thank you for the detailed reply Susan. Tuition and related school expenses really do add up! The tuition grant seems like a great program though for families that really need it, and works out really well if the family lives close to the University that they want to attend. I am saving RESP but I do not expect RESP alone can cover the expense of both tuition and living expenses. Also, recently I found it really depends on where you want to go to university. If the kids interested in software engineer, I would like them to go to Waterloo where the tuition will be close to $20K for software engineer, but they will have lots of chances for doing co-op, so after the first year it will be pretty easy. Anyway, I figure if the kids go to university in Canada, supporting them should not be a big problem, no matter where. I won’t support them 100%, but a major part for sure. I don’t want them to be stressed out with both working and studying. If they decided to go ivy league level university and luckily enough to be accepted, my backup plan is downsizing the house (I won’t need a big house any more anyway) and use the difference to support them. By the way, it’s much more than $50K now. Even tuition alone is more than that. Education becomes more and more important in current world. Kids’ tuition is definitely high priority in my financial plan. Thanks for stopping by May. I just googled Princeton tuition plus board and it’s estimated to be 70k usd! Here i thought that 50k was bad. Seems that scholarships play a huge role when going to school in the us. All ivy leagues have need-based financial assistance but no merit-based scholarships. I guess everyone being accepted is outstanding kid and difficult to give scholarship based on that. But I heard some of them are not so generous with international students. My friend’s son goes to UPenn with financial assistance and I am told the first year expense not more than going to a Canada University. And her son is so good that he became teaching assistance after the first term and financial independent already. But I dare not to set that kind of expectation for my kids so here I am saving………. The need-based financial assistance is largely depending on the family financial status. If there is hope your kids can go to ivy leagues, there will be some planning needed I guess. Anyway, Ivy leagues are so hard to get in so I basically do not worry about that. If I have to worry about it, it will be a good problem to have anyway. Just wondering why you went with individual RESP plans vs a Family RESP plan? I have all my kids in a family plan and wondering if there’s any pros or cons I’ve missed. Good question! The accounts are setup as a family resp but with separate portfolios. Is your family resp one big portfolio? If there’s still some money in the account once your children graduate from post-secondary, what would you plan to do with the additional funds? Leave it there in case they decide to do a Master’s program? Roll it into your RRSPs? I have a new niece and am thinking of gifting a bit of money into her RESP account, so this information was timely, thank you! I’m also curious where you found the 2.8% growth rate for tuition? Was that StatsCan as well? The plan right now is to spend cesg and growth first . If there is money left , hopefully I’ll withdraw tax free as original contributions can be withdrawn tax free. Yes the 2.8% was from stats can . We’re American citizens with 2 kids currently in post-secondary in Ontario. One is in the 3rd year and another starts in the fall. They are at 2 different universities in Ontario. The tuition in Ontario seems to be fairly consistent across all undergrad degrees – approximately $7K to $8K per year. The room and board (residency + meal plan) also seems to be consistent – approximately $12K to $13K per year. We have a family RESP and are allowed catch-up contributions for our youngest, currently in high school. Since we only became residents in 2011, our oldest 2 kids did not qualify for RESP. Each January, we put $5000 (our max allowed contribution) in an RESP and withdraw $6000 (principal + gov grant) in February which goes towards the tuition for our oldest 2 kids. Academic bursaries vary by institution. Queens, for example, where our son will be going in the fall, has a very high threshold (high marks for small bursaries). Other institutions appear to be more generous with bursaries. Regarding US schools, many states offer free tuition (paid for by the state lottery) to kids with high marks. Several public institutions are ranked very high in the world rankings, so this is an amazing benefit if you are fortunate to live in a state that has this program. We also have funds in a US 529 plan (like a TFSA) for each child. Fortunately, 529 plans can be used for all schools on the FAFSA list, which includes most colleges and universities in Canada. Thanks for stopping by and for the insightful information. Did your kids consider US schools as well? We are just starting our RESP here but we hope our baby will go Harvard (haha! Kind of joking). Gotta start aiming for 15% returns annually LOL. Thanks for the updated tuition fees. Dentistry is expensive I am assuming because of all the equipment and supplies. Hi GYM, you hit the bullseye, the equipment fees are through the roof. First-year dentistry student at Dalhousie will have to pay $54k of which $27.6k is an “auxiliary instrument fee”. I love these calculations as it’s already something I’m thinking about with my two year old. The tuition amounts are so variable depending on what she might want to study and where – close by please? :-). (Though hard for me to say that since I moved away for university!) We are trying to save enough to cover a basic undergrad degree. Beyond that I like the idea of her working/teaching if she wants to get a masters. Good points Dave, professional schools can get pricey! My 8 and 10 year olds have $96k in the family RESP I started the month my first child was born. $5,000 deposited January 1st every year. So far $55,000 in contributions, $11,000 in grants and $30k in growth. I also hope to have $100k for each of them and will want them to have skin in the game from part time and summer jobs. I was given a free ride and didn’t respect it and wasted a lot of my parents money. My wife had three part time jobs and parents gave her very little money to help with costs. Guess which one of us did better in University? That’s why like another poster above I will likely never tell them the value of the account and make sure they prove the desire to attend by working for it. Then maybe a nice lump sum when the are about to graduate towards a car or nice trip to Europe. TD Int’l Index-e** so that you can re-balance the portfolio? Thank you. Once you login to your TD account, click on “switch mutual funds”. From there, you’ll be able to transfer cash from your money market fund to your other funds. Faculty of Engineering, Software Engineering=	$18,250 + $2,150 / year! This throws all the calculations out of the water, unfortunately, if your kid is doing well enough to get into engineering. Hi Lee, yes certain programs definitely skew the average. The bright side about engineering is the opportunity for co-op work terms which can help offset tuition costs.